From ransomware protection to one-click communication with frequent contacts, the Fall Creators Update will introduce a host of business-friendly features to Microsoft Windows 10. Microsoft will release the next major update for Windows 10 in September, just five months after the last one, the Creators Update. The company has been offering sneak peeks at the upcoming release, named the Fall Creators Update, through its Windows Insider program. We’ve been keeping track of the Insider preview builds for the fall release as they’ve rolled out. Most of what the Fall Creators update will add to the OS will be under-the-hood features -- some new, some revised, and many related to security. Here are some improvements that enterprise users and IT pros should know about. In current versions of Windows 10, OneDrive appears as a folder in File Explorer. When you put files into the OneDrive folder while signed into Windows 10 with a business or personal Microsoft account, they’re uploaded to the cloud. If you sign into another Windows 10 computer with this same account, the files in your OneDrive folder will be downloaded to that computer. Having access to your files from any Windows 10 device is handy, but this automatic syncing behavior may not be convenient if your device is connected to a spotty Wi-Fi signal or is low on storage space. That said, you can limit syncing to certain folders within your OneDrive, but anything within those folders is synced. What’s more, if you have folders and files stored online only, they don’t appear in your OneDrive folder in File Explorer. To see them, you have to right-click the OneDrive icon in the notifications area of the taskbar and choose “View online” from the pop-up menu; your default browser will open to your cloud OneDrive. OneDrive in the Fall Creators Update will introduce a feature called OneDrive Files On-Demand that’s designed to smooth out OneDrive’s functionality. It will let you set OneDrive so it won’t forcibly sync files stored in the Microsoft cloud to the Windows 10 device you’re currently using, and you won’t have to launch a browser to access online files. Instead, there will be placeholder shortcuts for online files in your OneDrive folder in File Explorer, but the files themselves will not be on the device you’re using by default. If you double-click one of these shortcuts, the file it represents will then be downloaded and saved to the device. You can change a downloaded file back to an online-only file by right-clicking it and selecting “Free up space.” And you can mark certain files as “Always keep on this device” if you want them to be permanently available when you’re offline. For SharePoint Online teams that collaborate on files online, OneDrive Files On-Demand will help to reduce bandwidth usage, because files won’t be downloaded or re-downloaded on all synced devices whenever a new file is added or a change is made to an existing file in the team site. Introduced in 2009, Microsoft’s Enhanced Mitigation Experience Toolkit (EMET) is a free tool that recognizes security flaws in Windows systems and attempts to prevent malicious code from exploiting them using a variety of techniques. Mainly geared for enterprise use, EMET was for many years a valuable tool for IT pros in protecting user systems. But with Windows 10, Microsoft began baking better security protections into the operating system, rolling out major updates more frequently, and urging its customers to move to the new OS rather than use EMET with an older version of Windows. Although you can still install and run EMET on Windows 10, Microsoft has officially retired it, with an end-of-life date of July 31, 2018. However, many of EMET’s threat protections will be reborn in the Fall Creators Update as Windows Defender Exploit Guard. It will be part of Windows Defender Advanced Threat Protection, Microsoft’s enterprise security service. With Exploit Guard in place, threats like dangerous Office macros or websites that are spreading malware will be blocked. 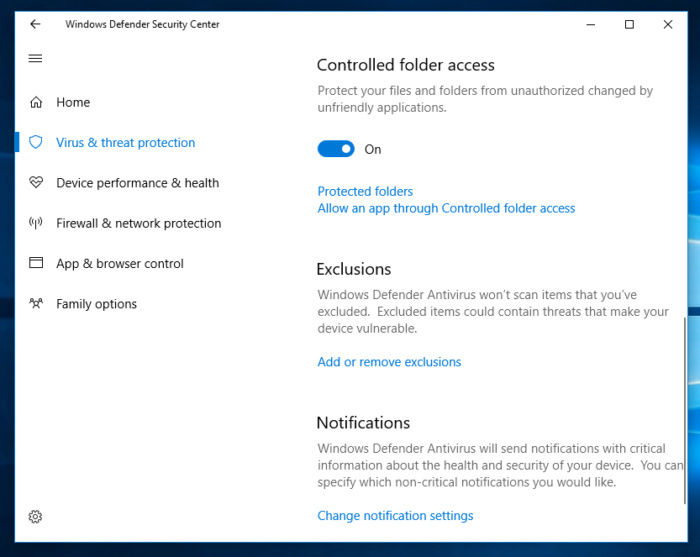 Windows Defender Security Center, the all-in-one security dashboard that was introduced in the Windows 10 Creators Update this spring, will also be upgraded in the Fall Creators Update to include EMET-style exploit protection. High-profile ransomware infections such as WannaCry spreading throughout the world’s computers and holding users’ files hostage have made the news recently. Although most of the affected systems were running older versions of Windows, Microsoft is hardening protections against ransomware in Windows 10. A new feature in the Fall Creators Update is designed to prevent such malware from locking up users’ personal files. The Windows Defender Security Center will have a switch called “Controlled folder access.” When it's turned on, only whitelisted apps will be able to access and change files in the Desktop, Documents, Music, Pictures and Videos folders. Should an app that hasn't been approved try to access these folders, Windows 10 will send an alert. Windows Defender Application Guard for Microsoft Edge is a new security feature in the Fall Creators Update aimed at keeping computers safe from zero-day attacks and other malware. It will be available only for computers running Windows 10 Enterprise Edition and Hyper-V. If malware attempts to harm the computer or office network by going through Edge, it probably won’t be able to cause damage because it will be confined within the VM. When the user ends the session, the VM container and any malware in it are discarded. 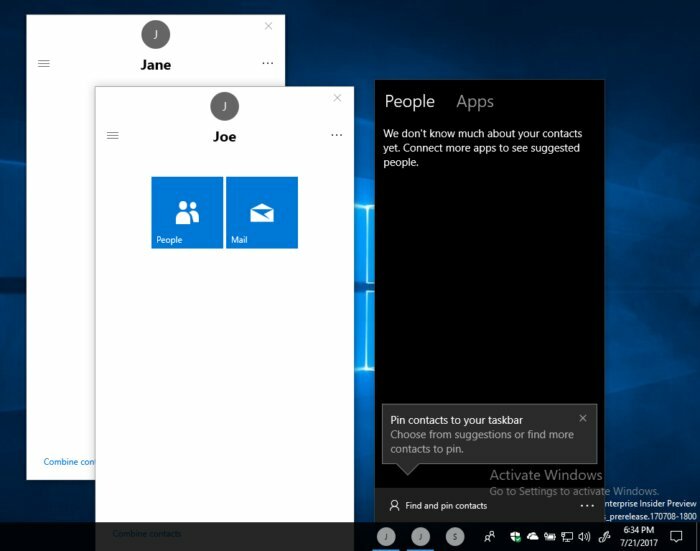 My People requires you and the contacts you wish to pin to have the Windows 10 apps Mail, People or Skype; when you initiate it, it will surface people in your contacts list who have those apps. To activate My People for the first time, launch the People app; to access My People after it’s been activated, click its icon in the notifications area of the taskbar. Sometimes when an older desktop app is shown on a large display with a high resolution, its text and graphics appear blurry. And many desktop apps can become blurry after users dock or undock their laptops, move an app window between displays with different resolutions, or remote into one device from another device with a different display resolution. Getting apps that become blurry after docking/undocking or otherwise changing the resolution to become crisp and clear again generally requires rebooting Windows. The problem with legacy apps on hi-res displays can sometimes be fixed by manually tweaking the Compatibility settings for the problematic app, but Windows sometimes requires a restart for the changes to take hold. Either way, it’s an inconvenience and a productivity hit for users. The Fall Creators Update will do away with this hassle, helping to maintain system uptime. All the user needs to do is shut down the desktop app and relaunch it for the crisper rendering to take. It should be noted, though, that this feature may not work on all desktop apps, and it won’t work on apps that appear blurry on a second monitor that’s been set as the “extended” screen to the primary monitor. The Task Manager, an old-school tool for troubleshooting Windows and keeping tabs on its performance, adds a new trick in the Fall Creators Update: It will show the status of the computer’s graphics processing unit processes on its Performance tab. It will also list the GPU’s memory size and current usage, driver version, the version of DirectX that it’s running, and where the processor is physically located on the computer’s motherboard. Applications used to view or create graphically rich content -- such as animated presentations, videos, and documents or spreadsheets with 3D charts -- could be relying on the GPU, and being able to check its status can help diagnose issues with a computer’s overall performance. This feature should be useful for network administrators: the ability to limit the amount of bandwidth that Windows update can use to automatically download updates for Windows 10, or share update files with other computers over a local network or the internet. The option will be listed in the Settings app under Delivery Optimization > Advanced options. There will be three sliders. 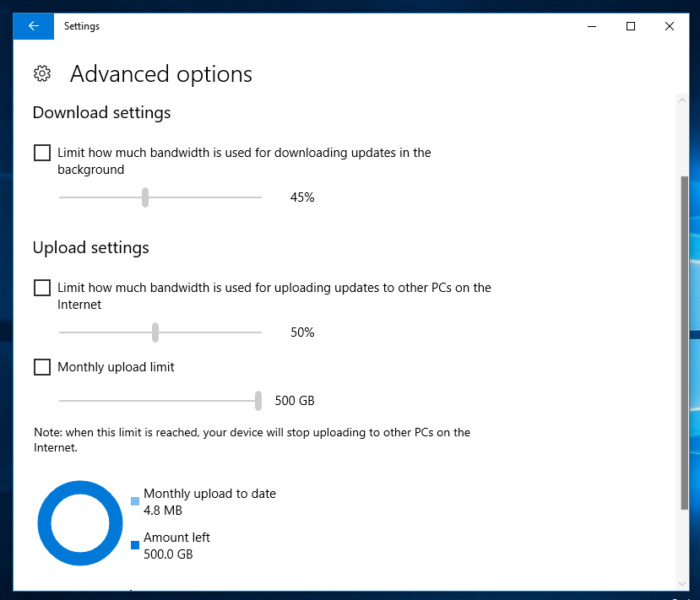 The first two will let you adjust the amount of bandwidth data that Windows Update can consume during downloads and uploads, ranging from 5% to 100%. The third slider will cap the total data that Windows Update can upload per month, from 5GB to 500GB. To extend the battery runtime of laptops and other mobile devices running Windows 10, the Fall Creators Update will throttle the system usage of apps running in the background. If a user is interacting with an app or if an app such as a video player is running in the foreground, Windows should recognize this activity and prioritize system resources for it. Otherwise, it will put opened apps that aren’t being actively used, or system executables that normally run without user interaction, into an energy efficient mode that will help the battery last longer -- a change that business travelers will welcome. In the current Insider Builds, this power-throttling feature works only with Intel Skylake and newer processors. Microsoft says it plans for throttling to support other processors in the future, but it’s unclear whether this will happen by the time the Fall Creators Update is released.